"What was that?" Cathy asked. "Birds, I think", I answered casually. "No, I think it is a kitty!" she said with excitement in her voice. How Cathy ever heard his cries for help is beyond me. Maybe it is a gift only Mothers have. So, once again, we left the comfort of our living room and ventured out in search of a kitty in need. Unlike Mimi, Max made it hard. Mimi stood at the front door demanding to be let in but Max was lost in the bushes. "Over here!" ... and nothing " I think he is in these bushes!" I said spotting a small light colored blur scamper away. Reaching under the shrubs with my right hand, I scooped him up. Cradling him in my arms, he looked at me and said hello for the first time, "Meow", like only a frightened kitten could do. Cathy going into automatic mode, got the milk out. Next came the towel, then Mimi's old cloth hut. We inspected our new Charge only see what appeared like blood on his mouth. When we put him down to watch him walk - he favored his right front leg. Cathy called the emergency veterinary clinic and soon we spoke with the veterinarian on duty at 10:30 this hot July Thursday night. 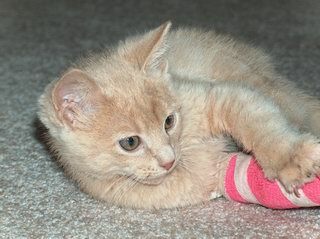 "He has a broken jaw but his leg does not seem to be broken. He is alert so it appears he does not have serious brain damage but you will not know until he is older." was the diagnosis standing in the lobby of the hospital. "Take him to your regular veterinarian tomorrow morning so he can start with the Doctor who will take care of him." he suggested with no charge. So, off we went back home to start our new lives with Max and Mimi, our cats. As I wrote upon finding Mimi: "When do you chose what happens in life instead of life selecting you?" it happened again for us. We had been talking about getting two small indoor dogs soon so I could begin my life-long dream of raising puppies. But now all that was on hold. Higher priorities had taken over. The next morning, Max was in surgery at the Friendship Animal Hospital. Dr. Cross put a wire in his jaw, a splint on his leg and pulled a broken tooth before sending him home for a little R&R the next afternoon. 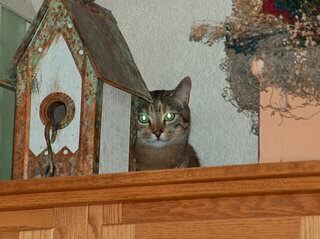 Meanwhile, Mimi looked on... Not sure if the new smell was a huge male predator or something harmless, she retreated into the dark corners watching every movement and listening to every new sound. After all, this was her home and she needed to understand what was going on. 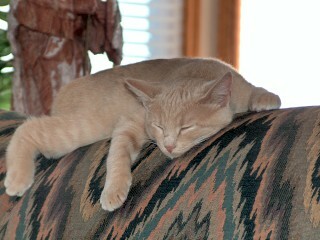 Max is a Dilute Orange Tabby. They say he will grow up to be a big cat. We can already see that he is playful like a ... well like a kitten ... and strong. 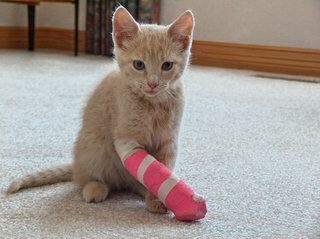 He climbs the stairs with his cast on not bothered by a leg or a step. He is one determined feline! He is a survivor. We are not sure what happened to Max. 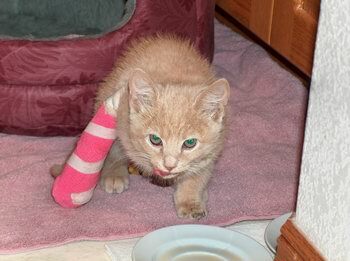 The veterinarians said he was probably hit by a car that afternoon or early evening. We don't know where he came from, just like Mimi. And we don't know why he choose us. All we do know is that Max would have died a painful and lonely death if he was not found that night. So, now we are a two cat family. We are sure they will learn to get along ... even if it kills us! But we are very happy to have saved another life from a preventable death. We have had so much joy from Mimi that we cannot image our lives without her. Max brought instant satisfaction into our home and we are sure that he will contribute to our lives in a special way. Animals are special. They change lives in ways humans cannot do. This little guy came into our lives for a reason. We accept our responsibility with gratitude and love. Welcome to our family Max!